NordicBet Casino’s homepage is very colourful and bold and features quite heavily on animated cartoon characters as sort of mascots. As well as the casino portion of the site, NordicBet also has a sports betting facility, live betting facilities and a whole load of live casino, poker and table game functions. Considering NordicBet is one of the absolute big boys in the online casino market, it shouldn’t come as a surprise that they have pretty much every base covered. Players can select from several language choices including English, Danish, Finnish, Norwegian and Swedish and players have a lot of currency options as well, with players allowed to wager and play in either Euros, Norwegian Kroner, Swedish Kroner, US Dollars and Danish Kroner. This is a very easily accessible game with very few restrictions on who can play, players from the US being the most noticeable omission. There are three different casinos on NordicBet: red, black and the live casino and the promotions vary between all of them so its worthwhile taking the time to have a good look through them all and deciding which promotions you like the look of most. The promotions page of the website is possibly the only part of the website that could do with some attention. The promotions do vary depending on which country players are accessing the website from which can cause some confusion. Be sure to check your country section here at Free-Spins.org to claim the current free spins offer for your country on Nordicbet. The best way to take advantage of the promotions on offer is to keep an eye on the forums and twitter feed which is where new promotions will more often than not end up. The bonuses at NordicBet are very similar to what players are accustomed to. Bonuses when players place their first deposit, and occasionally, depending on what promotions are being run at the time, on other deposits. NordicBet also feature quite heavily on seasonal promotions so keep a look out over the holiday period to make sure you take full advantage of all of the promotions. The mobile version of NordicBet is very smooth and simple to use with big buttons and all of the functionality of the full desktop browser site. Players can log in using their desktop account details and this allows for a lovely feeling of continuity through the site. The casino part of the mobile version also runs smoothly and loads very quickly assuming you have reasonably decent mobile signal, although purely for peace of mind, playing when attached to WiFi is definitely the way forwards. The games on NordicBet are, as you would expect from such a large player in the market, very varied, numerous and of exceptional quality. There is a large selection of video slots available to play, including Hall of Gods, Jack Hammer, Gonzo’s Quest, Flowers and Starburst as well as a whole load of others. The slot games are developed by Net Entertainment and this means they are beautifully designed and run incredibly smoothly, whilst offering some impressive progressive jackpots and pay out percentages. If you fancy table games then Nordic Bet have you covered there as well. You can choose from Blackjack, Baccarat and Roulette as well as many more including lots of less common games. Video poker is well catered for as well on Nordic Bet with 4 obvious variations of the game; Jacks or Better, Deuces Wild, Joker Wild and All-American Poker. 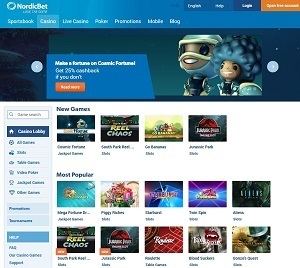 Nordic Bet have really pulled their finger out with the game selection and given players a real headache trying to choose which game to play. All of the regular avenues are available for players to use when contacting Nordic Bet and the response time and quality of the responses is excellent. The most widely used method is the live chat function which is manned round the clock. Players can also ring the phone number but this is only available between 8am and 10pm, Central European Time but does provide a high quality response first time every time. The regular frequently asked questions and email contact form are available for players to use at their discretion and they are both high quality. You can place deposits and make withdrawals using a whole load of different methods, including but by no means limited to, bank wire transfer, major credit and debit cards, Neteller and other methods. Money is deposited almost immediately and if you use the E-wallet method of withdrawing funds, this can be in your account within 24 hours. Also, unlike other online casinos, Nordic Bet allow players to withdraw as much as they like every month with absolutely no withdrawal limit.